Thinking about my gardens (as I do on Tuesday) perhaps the most exciting image I have taken in one of my gardens was of this one at Whistler's Rest in February 2011. There was a spider's web stretched across my path and I noticed a tiny spider that glinted with a little bit of colour in the sunlight. 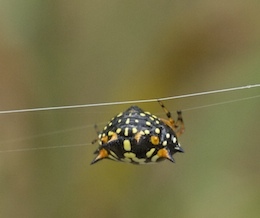 My eyesight was not up to fine detail so I poked my camera in her direction and clicked a few times as she scurried along her web ... thinking something interesting might be picked up by my lens. I had no idea I had captured one of these exquisite creatures. Certainly interesting. I am not a great lover of spiders and tend not to photograph them, but I realise I probably miss out on something amazing. The bug world some amazing shapes and colours. Not my specialty either. It is not just the markings. There are pointy bits too. Amazing colours. What a lovely surprise for you. The black body makes the colours stand out. Colorful, yet anything with more than 4 legs freaks me out a bit (I know... and then I come to Australia, the joke is on me). I am sure have spiders in your land. We just like to make out ours are especially ferocious to attract tourists.